This web site is for informational and advertising purposes only. Jay Norton is the attorney responsible for all of the content in the advertising material. The law firm of Norton Hare, L.L.C., is based in Overland Park, Kansas. None of the information contained in the Norton Hare, L.L.C. website should be construed as legal advice and it does not create an attorney-client relationship between the viewer and Norton Hare, L.L.C. absent an express agreement between the law firm and the viewer. Every legal matter is different and the information in these pages may not be applicable to any one specific case. The viewer should neither take nor refrain from taking any action on the basis of any information on this Web site without first seeking appropriate legal or other professional advice. The receipt of an email from our law firm, even in response to a specific question, does not create an attorney-client relationship and no email exchange should be considered confidential. 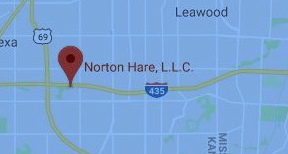 All attorneys at Norton Hare, L.L.C. are licensed in the state of Kansas. Attorneys J. Ryan Hare and Lindsay Hare, are licensed in Missouri, as well. None of the information in this Web site pertains to any states other than Kansas and Missouri and should not be construed as solicitation of business in those or any other states. Norton Hare, L.L.C. specifically disclaims any warranties of services this Web site may seem to offer. If you are unclear about the terms of this disclaimer, the accuracy of any information on the website, or if you have a Kansas DUI, Missouri DUI, federal, state or municipal criminal charge in Kansas or Missouri, a personal injury case in Kansas or Missouri, or a domestic relations case in Kansas, please feel free to contact our law firm for further information.